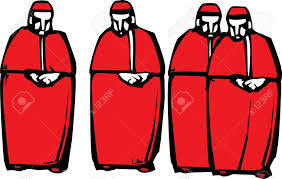 I can only second the call for the hierarchy to do their jobs and stand with Our Lord against any who would attempt to destroy or desecrate His Bride the Church. I can only second his call for the flock to be assiduous in the task of defending themselves as best they can from the wolves. "When the shepherd becomes a wolf, the first duty of the flock is to defend itself. The true children of Holy Church, at such times, are those who walk by the light of their Baptism, not the cowardly souls who, under the specious pretext of submission to the powers that be, delay their opposition to the enemy in the hope of receiving instructions which are neither necessary nor desirable." The last time the hierarchy did its job in calling out a wayward Pope, they got ex-communicated. With every passing day, seems to me Msgr. LeFevbre is vindicated. Perhaps he was the true Athanasius of our time (along with Cdl. Ottaviani) and we just didn't know it until now. Thanks. I am glad if our troubles are a grace for you. You prompt me to say about the same. Things haven't been right since I was a little non-Catholic boy in the early 60's. Starting with when Pope John opined that Sister Lucia's third secret, and the consecration of Russia, "was not for out times". No. Let's call an ecumenical council and invite the Communi...er, Russian Orthodox to attend, that lasts for four years instead of having a ceremony that lasts ten minutes. The crisis in the Church didn't, and couldn't start with Pope Francis. The New Mass (1970) was and is the biggest part of the disaster in the church with its defective Latin and even worse, horrible translations. In the so-called and seldom used Roman Canon of the New Mass, which in Latin does bear some resemblance to the Old Mass, the Nobis quoque peccatoribus, "To us sinners also", is the same Latin, but translated as "For ourselves too" in America. No peccatoribus in America! The New Mass, with its denial that we are sinners has misformed the consciences of most of the neo-conservatives like Cd. Burke who pretend that the crisis is new, that things were great while St. John Paul II prayed with witch doctors. The funny thing is that all of the indult communities have acted for almost thirty years like everything was all cool in Tradition until 1988, when an aging Abp. Lefebrve got cold feet about an agreement with Rome. They had agreed with him while he was only "suspended" by Rome for the previous thirteen years, but the consecration of the bishops apparently showed them how wrong he(and they) had been. I guess it was okay to be suspended (schismatic) for believing that the New Mass was defective. But the emergency wasn't such that he should have distrusted conciliar Rome so much as to make more bishops. No. He should just have died suspended without providing for the future. Then everything would have been so much better. My question for indult (anti-SSPX) Traditonalists today is this: In 2017, do you really wish Abp. Lefebvre hadn't consecrated the bishops? Can you possibly think that the New Mass which Cd. Burke and Pope Benedict XVI call "the Ordinary Form" would have accurate translations, while the Old Mass would be much more available if only Marcel Lefebvre and his little followers had obeyed conciliar Rome in 1988? Its long. Edit as you see fit. If you don't agree entirely, I trust you will appreciate a lot of it. Make no mistake, I think we are on the same side, and I hope your Cd. Burke too. May Our Lady of Perpetual Help raise him up. 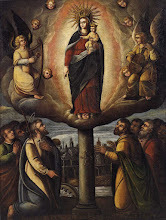 This site is dedicated to Our Blessed Mother, and I ask for her maternal guidance and protection. A Catholic defending the faith until the meteor hits. News Flash: Unam Sanctam still in effect. Premature Glee on the Veiling Issue? "...And Know the Place for the First Time"
End of the World Stuff, or Bob? “You are the ones who are happy; you who remain within the Church by your Faith, who hold firmly to the foundations of the Faith which has come down to you from Apostolic Tradition. And if an execrable jealousy has tried to shake it on a number of occasions, it has not succeeded. They are the ones who have broken away from it in the present crisis. No one, ever, will prevail against your Faith, beloved Brothers. And we believe that God will give us our churches back some day."